Includes boat dock, boat ramp, canoe launch, disabled access picnic area, disabled access restroom, dog off-leash area, paths – paved, paths – unpaved, picnic shelter, picnic site – reservable, picnic tables, playground, soccer field, tennis court, and tennis court – lighted. 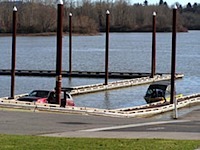 The park is part of the Willamette River floodplain and used to be called 'Carp Flats' - referring to access to carp during seasonal flooding. One of the largest Oregon white oaks along the Willamette Greenway. Park hours: 5:00am-10:00pm. Closed to vehicles at 10:00pm. 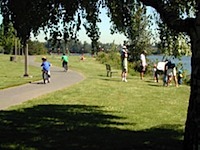 The park can be accessed via Nebraska, Nevada, Miles Place, Beaver Ave, and the Willamette Greenway Trail. To reserve a sports field or picnic area, call 503-823-2525. Purple martins nest near the boat ramp. Other birds frequenting the park include gulls, sandpipers, cormorants, kingfishers, and swallows. From the north end of the park it's possible to see great blue heron and bald eagle nests on Ross Island. Osprey and Canada geese nests are visible on transmission towers on the east bank of the river near Oaks Bottom. Beavers are present in the area. Discover new places with Business Directory. John's Landing has various businesses spread out. With Business Directory you can search by categories and discover new beginnings. Copyright © 2012 Johnslanding.org. All rights reserved.